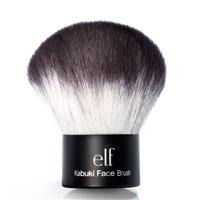 E.L.F Kabuki Face Brush is the softest brush I’ve ever used! While I was preparing myself to write a review of this brush, there were some others that appeared here. So, now I can say that I’m a true fan of this Kabuki brush! I bought it to apply my powder, so I haven’t even tried to apply any other products with its help. INFORMATION Kabuki is a brush specially designed for mineral make-up application. It’s also ideal for thick powder coverage and blush blending out. OUTER APPEARANCE The brush was packed in a usual small box. The brush was placed on a special holder to prevent damages and shape loss. Heey! My today's review is dedicated to the Kabuki brush from E.L.F. I’ve been using it for a few months already, but I still don’t know what opinion I have towards it. A little digression. Hello everybody I’m posting a review of the E.L.F . Studio Kabuki Face Brush. Even though I’m a newbie in a beauty world, I liked this brush very much. A few facts about the product: Name: E.L.F. My skin looks expensive and excellent! Healthy glowing skin, mattifying effect and all that is about the high definition sheer powder by E.L.F. !